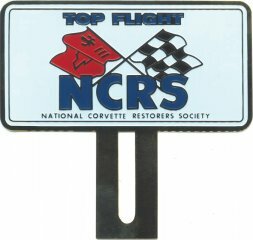 Show everyone that you're an NCRS member at every Corvette show! A full-color medallion of the NCRS logo and the words "Top Flight" for mounting with your license plate. 1953-1967's only. "Sorry- currently only available for 1953-67 model year Corvettes."